Brushing twice a day or after meals plays an essential role in maintaining your dental health. However, brushing too soon after meals can actually damage your teeth and leave them more vulnerable to tooth decay or enamel damage. According to research, brushing within 30 minutes of eating may not be beneficial and can even harm your dental health. When you eat a meal or drink acidic beverages, the bacteria in your mouth produce acids that can dissolve the enamel on your teeth. Your saliva helps remineralize them to keep them strong, but if you interfere with this process by brushing right after eating or drinking, the enamel on your teeth can become scratched, and the acid can be pushed deep inside your teeth. Waiting 30 minutes can help you keep your teeth stronger, healthier and more resilient to acid attacks. When you do brush, use a soft-bristled toothbrush and fluoride toothpaste, which can reduce the risk of damage to your teeth and gums. Use dental floss to remove debris and plaque from between your teeth. If you are unable to brush in the recommended time after a meal, rinse your mouth thoroughly with water in order to reduce bacteria and debris. Chewing sugar-free gum can also help dislodge debris and stimulate saliva flow, which can help remineralize your teeth. Brush your teeth at least twice a day to keep your teeth healthy and free of decay. 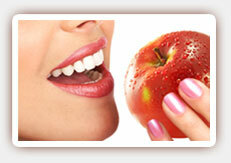 Contact our dentist in West Hollywood today to learn more or to schedule your next appointment.